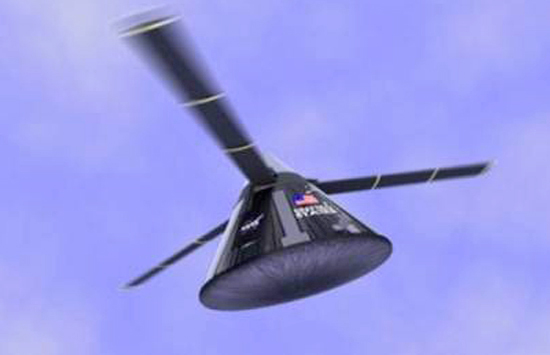 An artist concept shows a capsule with a rotor blade system (Credits: NASA). NASA’s researchers are developing scale model space capsules at Kennedy Space Center (KSC) in Florida. The models are intended to prove an innovative system of reentry using helicopter rotors instead of parachutes. “Well, this is taking the capsule entry technology and helicopter rotor technology and merging those in an innovative way to make something that didn’t exist before out of two things that did exist before,” said Les Boatright, an engineer at KSC. The test at KSC has been conducted to study how to get the rotor starting to spin. NASA’s researchers succeed in slowing down the 2 lb (0.91 kg) unpowered scale model spacecraft in a drop test from 480 feet (146 m). The testing has also demonstrated that the airflow around the hinges is balanced, so the blades hold strong without folding up. The idea behind the project is to give the reentry capsule control and stability using a non-powered helicopter rotor. The velocity acquired by the capsule after reentry in the atmosphere would make the blades turn and the rotors would be put in motion by the wind passing over. This process is called auto-rotation and it has been proven many times on helicopters. The capsule should also be equipped with control fins on the side, to prevent it from revolving with the blades. Researchers think that this concept could also fit with spent rocket boosters. The rotors, built intothe booster’s frame, would be unfurled as the stage descends to the ground. Therefore the boosters would be controllable and would land softly, saving the expensive engine to be reused again. The drop test is an easy way to validate the idea, but then high-tech evaluations must be conducted before this reentry device could be flown into space. However, moving through this stage is critical to convince people of the feasibility of the idea. The idea itself is not totally new: NASA explored the concept during the Apollo development but in the end decided for the parachute option. In fact, the parachute required a shorter development time, a necessary requirement during the Moon race. If the project moves forward, the next experimental steps would include hanging a roto-capsule on a high-altitude balloon for release and the reentry of a small capsule with fragile science samples from the International Space Station. These are all necessary stages before rotors could be entrusted with the lives of astronauts.